Over the last few weeks I have been sharing photos and info about the models I built to help me design, visualize, and draw Darkheather in Winter 1152 (pt1, pt2).This week I'm showing the location of one of the most emotinally important scenes in Winter 1152. Once Saxon climbs down the pile of bones in the bone chamber, he finds a maze of prisons...or at least, that was my intent. I tried to come up with an idea for the shapes and designs of the prisons beyond the chamber, where Saxon ultimately has a very emotional discovery, but with little success. In one of those magic moments as I was going to sleep (or waking up, I don't recall which it was now) I envisioned a floorplan that would resemble a repeating design like the tilework of the weasels'. 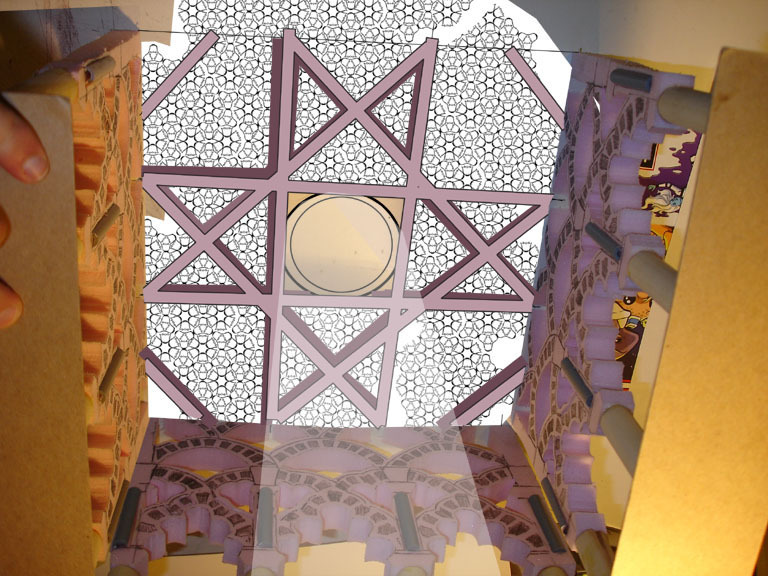 It would start with a hexagonal hub that leads out to triangular columns and stone archways repeating the shapes from the bone chamber to connect it all. This image with digital help over-top a photo of the model you can see that even though the geometry isn't perfect, you can imagine the floorplan repeating all around the bone chamber. The model itself started with the hexagonal center and the six triangular columns from my half dreaming floorplan idea with archway pieces cut with a stencil many, many, many times over to be used as connecting pieces between the columns. I wasn't as precise as I should have been, and the bristol had more flex that I wished, so the model became unsymmetrical and warped as I built. 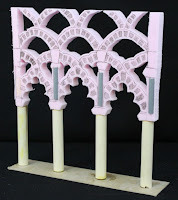 The wood strapping accross the tops of the arches were glued on in hopes of correcting that as much as possible. At the bottom of this photo you can see I tried to match the shape and angles of the entry archways from the bone room. These prisons are only seen for a few brief pages in Winter 1152, and I may have over thought the design of the prison, but when my mind was blank, I thought I'd have the quickest and best success for design by assembling a model. This way if I ever need to revisit this or any other Darkheather location, I can dust off the model and get the characters right back in there. To the right you can see a few panels of Saxon's journey through there. Morgan Bilicki (who, with her friends, sent in painted fan art previously) recently emailed a photo of her knit fan art. She writes: "I'm a knitter, so it was only a matter of time before I made my own mouse with yarn. I designed the pattern myself and knitted him up. 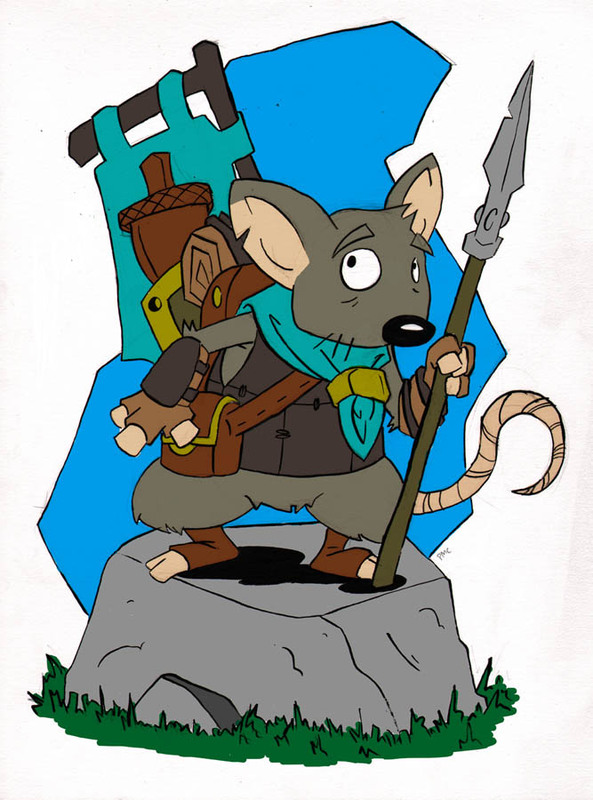 So, here's Kenzie of the Mouse Guard"
Time to continue from the model post I did a few weeks back. 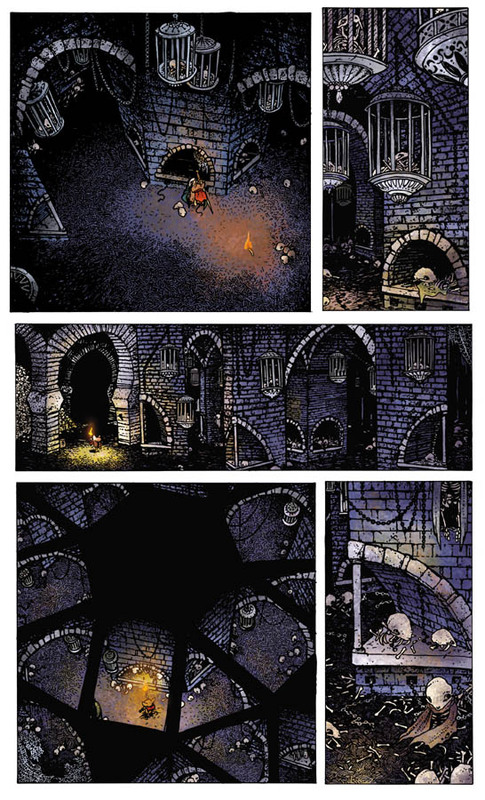 In the 4th Issue (chapter) of Winter 1152 Saxon plummets through a hole in the Darkheather tunnels into a room piled with the bones of weasel victims/meals long past. In a past blogpost I quickly showed and mentioned the model I made for the room, but wanted to go into more detail here. Sometimes I find that trying to build a physical model helps me design a space much quicker than if I tried sketching out ideas. 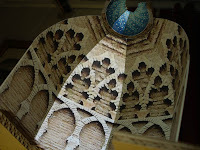 I had a few photos of various arches & architectural details I thought appropriate for the architecture of Darkheather. 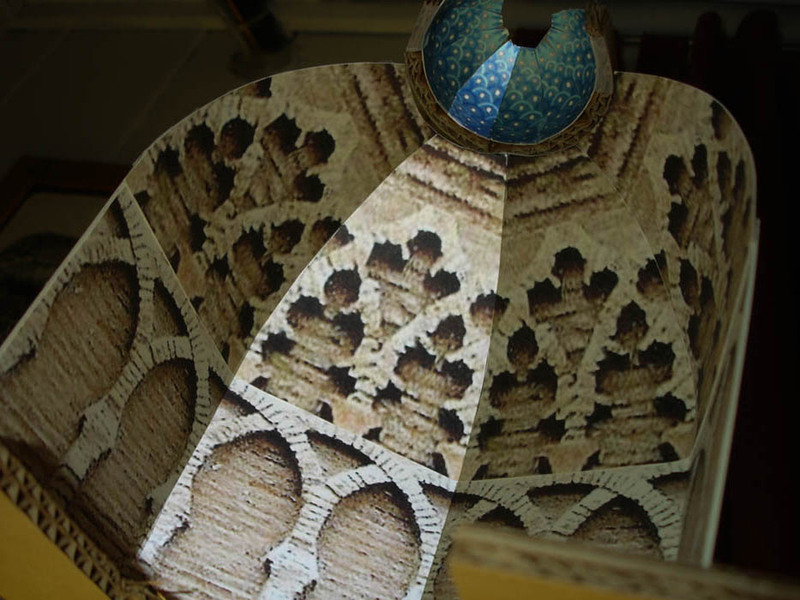 In photoshop I stacked two arch patterns on top of each other and made the overall shape a wedge. 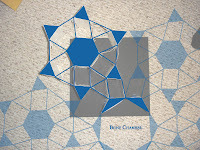 I printed out several copies of the image, pasting them to bristol board and then attaching their sides to each other in what would be a octagon (but I left 4 sides off so I could see into the model.) In this photo you can see I've highlighted one section of the photo-collage so you can see how it was assembled. This idea of repeating a section of something to make a bigger something seem like the sum of more than its parts was something I learned in 2D Design class (one of the most important classes I ever took). The room was glued to a piece of cardboard which I cut a hole into so I could view the model from below. 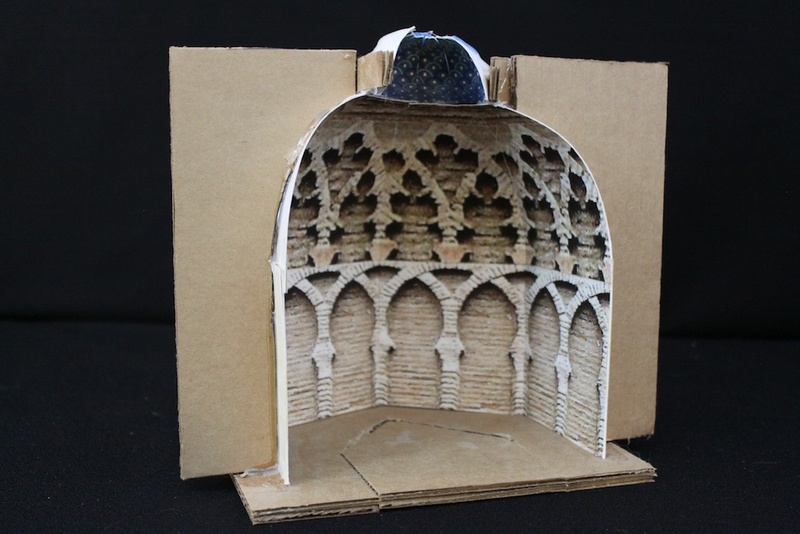 To help the bristol board walls to keep their shape and not distort, I added the cardboard arch wings. Building a model like this only took an hour or so, but it saved me a lot of time in design and in imagining the way it would look in various angles and perspectives. Below you can see some panels from the book of the bone chamber. 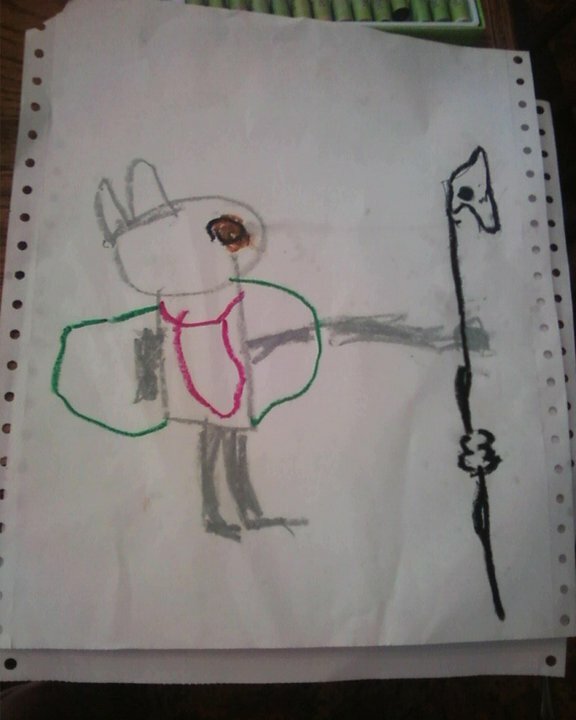 This work by Isaac Montalbano (7) was sent to me by his mother Sarah. She writes: "By some chance our local library put Fall 1152 in the children's section on display. Even though the book is usually upstairs in the Young Adult section. If this hadn't happened I never would have seen it next to the water fountain. I myself love pretty much anything to do with the medieval time period and I have been picking up Brian Jaques books at Goodwill or tag sales and they wait on the shelf for my three sons to become full fledged readers. Anyway, when I brought Mouse Guard home we knew it was love. 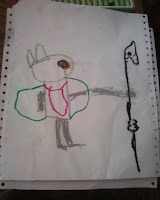 A while ago Isaac was inspired to draw his own version of The Black Axe, The green part is the cloak, and the reason one arm is super long is that the other arm is folded and also his head is turned to look at the axe which is why he only has one eye." For the last four days Julia and I have been visiting at my Dad & his wife's place in Ludington, MI. Ludington has long been a wellspring of inspiration for me and has served as a reference point for a great deal of Mouse Guard artwork & locations. I went for a walk yesterday along one of my favorite paths up on a wooded bluff that occasionally overlooks Lake Michigan. These photos I took then will be added to a folder at home I use to recharge the creative spark when working on my books. I wanted to share this place with my blog readers. I love seeing these critter holes and imagining what kind of houses they would build if these were their front entryways. I suppose the tall grass acts like what would be a decorative tree or bush outside a human home. Here is another one of those openings that could serve as a gate to a hidden city of mice, or chipmunks, or voles. I love the lumpy and organic shapes trees can have, and it's fun to imagine how that could effect the shape of the inner dwelling. I did a spot illustration trying to capture the feel of looking up at light dancing through a canopy of leaves in the RPG hardcover. It looked odd in black & white, but started to resemble a leafy light filter when I gave it some color. Using focused bits of nature like this not only help me set the mood and atmosphere of Mouse Guard, but it also sets up the idea of scale...instead of showing a full forest floor, I can show the details of a few berries and leaves so the audience starts to think in terms of mouse-size. In this photo overlooking the bluff & lake, I tried to show the inspiration for the shift from water to sand to grass to dark tree cover in Black Axe issue 1 when Celanawe leads Em away from the shoreline. Like the berries above, these mushrooms shown from the undersize go a long way to explain scale and point of view. I also think mushrooms are just visually cool. Erroded sand has left half of this tree's root system exposed. This path is littered with them and they always remind me of Ringwraiths from Lord of the Rings. Not only is the setting pretty well suited for the hobbits to use this as a hiding place when they are hunted, but also the dark exploring finger-ey roots remind me of the wraiths themselves. I set Celanawe & Em's own hiding place here in Black Axe 1. Lastly, because I'm a texture & pattern guy I like focusing on things like bark. I hope you enjoyed a glimpse of the place I retreat to when I need to get back to the soul of childhood exploration and wonder. I camped near there when I was a kid, swam right in those waves since I was three, read the first Harry Potter book to Julia outside the woods there, proposed to Julia on the beach, and have been making wonderful new memories with my nieces the past few years. It's special to me and I hope you enjoyed my indulgence in sharing it with you. In Winter 1152 Kenzie, Saxon, & Sadie are plunged into the seemingly abandoned Weasel kingdom of Darkheather. 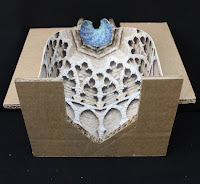 My original concept for the designs were going to be more Norse but after thinking how well Moorish architecture would fit into an underground domain with the columns & arches to support the "cave" ceiling, I went that direction. At first, I tried drawing the location purely using reference photos, but after feeling like a slave to them, I switched to building the model shown here (which I talked about briefly in a past post). 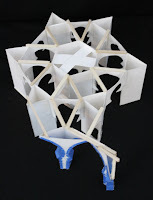 It is made of insulating foam, dowel, and a few bits of plastic tubing. 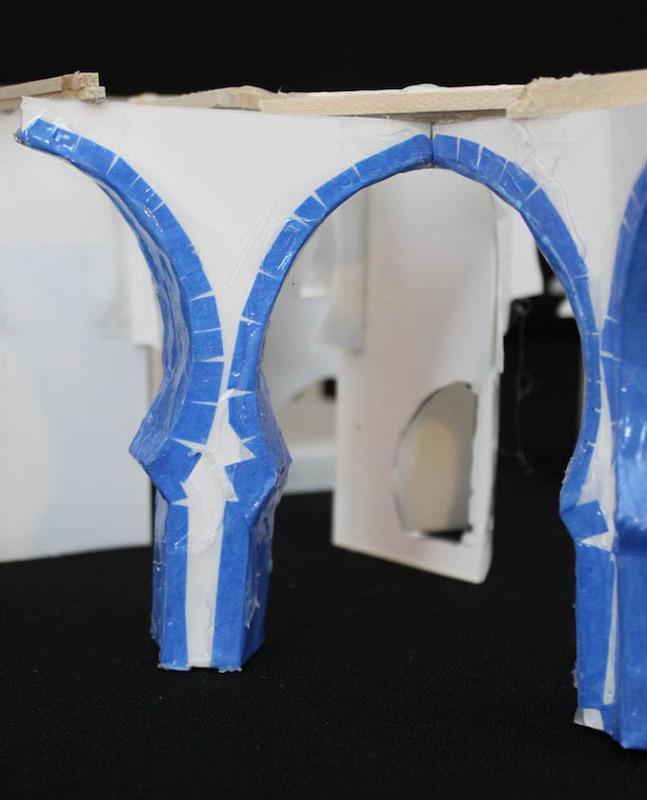 The model proved useful for examining the arch shapes at various difficult angles, but also for figuring out what shapes appear in the negative spaces of the arches when it is repeated down a hallway. Locking down a camera on a tripod, I was able to take three successive photos and assemble them in photoshop. 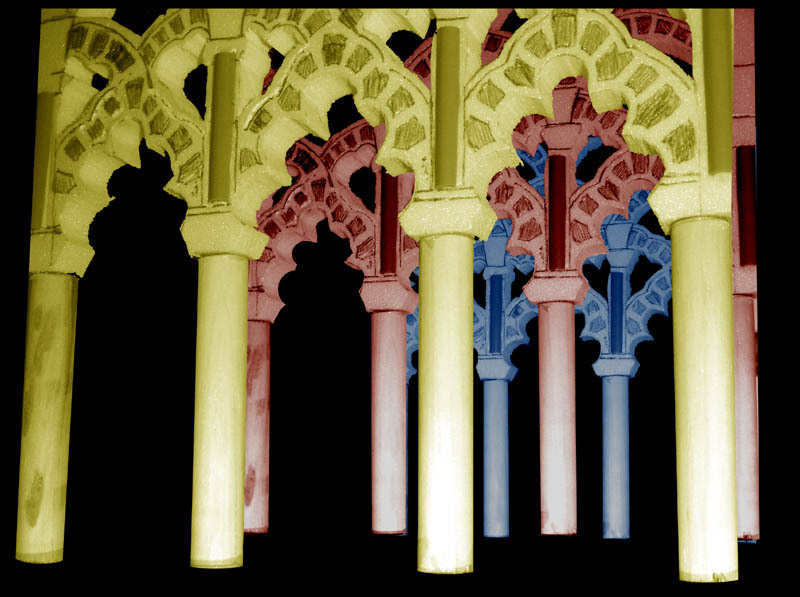 I have tinted the three depths different colors to help my eye make sense of what details are on what level of depth. The Darkheather guide page (found in the extras of Winter and online here) was drawn after I had finished Winter 1152's six issues. 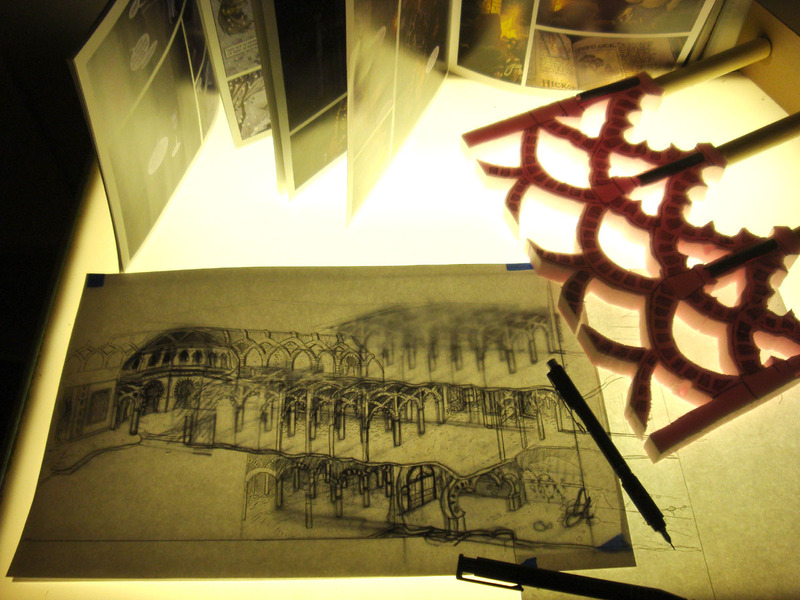 I looked back at various scenes and settings from the story to try and assemble a multi-layered floorplan with a path the mice followed that made sense. I pulled out my trusty arch model to look at for reference as I drew arch after arch after arch. Next Time, I'll have pt. 2 of the Darkheather models: The Bone Room. 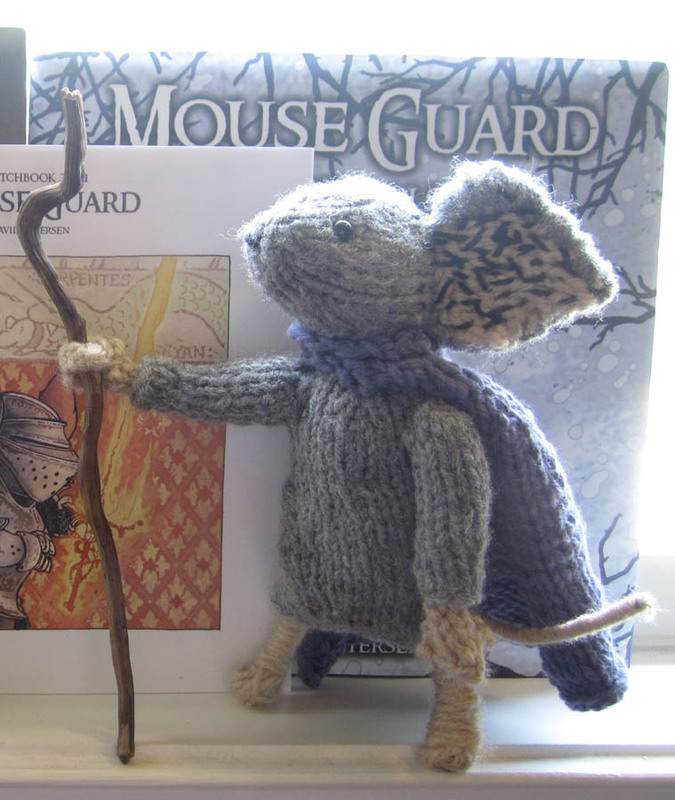 Paige Connelly sent this Mouse Guard fan art my way. She is an animation & illustration student working towards her BFA. She hopes to start the RPG soon with some fellow students. I think this is a great mouse piece, it clearly shows the preperation, packing, and weariness the life of a Guarmouse must take on. Looks like Paige has a start for her RPG character!